REVIEW – How to lose everything that was related to us, and, thanks to the marketing, not to mention the bag of money via the Epic Games Store, hope that people will end up buying our game, god knows how many episode. Featuring three ex-Criterion members. This is not a Burnout game. Or is it? I’d have gladly swapped the format here, but since I do not have an interest in receiving yet another complaint novel, I’m not going to use a dialogue format in how Dangerous Driving isn’t exactly something that the Burnout series was on the PlayStation 2 (fine, include Burnout Paradise, too…), as it has a few points that don’t give it a high score at the end of the day. 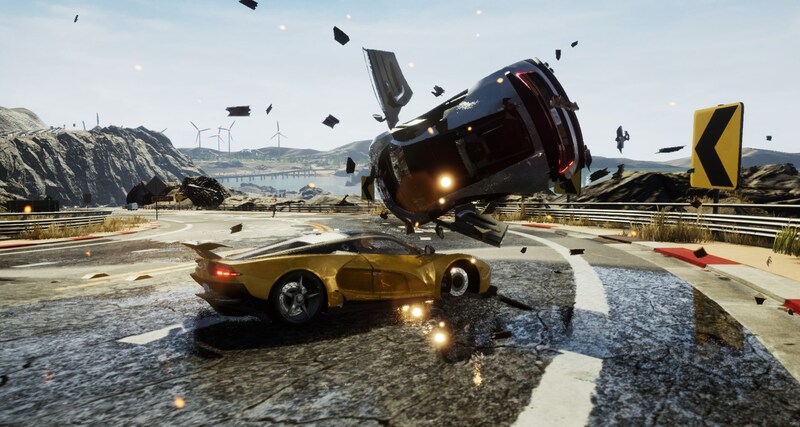 Thanks to the Unreal Engine 4, Dangerous Driving looks visually impressive, and it runs with decent performance, which could satisfy those who love to avoid the traffic, using the opposing lane, earning nitrous, all to avoid getting the car totalled, which results in watching that scene for several seconds. There is no story in this game whatsoever, so I cannot discuss this (but at least it allows me to waste a sentence on it, and I think I deserve this, sorry! ), so let’s talk about something else that I could have only reacted to by saying nothing else than LOL: in the options, you see buttons to change tracks of the soundtrack. I start the race. No background music. GG, using the PC version, I have experienced a lack of soundtrack. What on Earth did the devs spend the Epic money on then? There’s no music, and that is one of the essential parts of the ambience in a Burnout game! Goddamnit! But what about the sounds, you may ask if you are still haven’t clicked that X on your browser’s tab (which I recommend)? No, not really. The sound of the nitrous, and here comes my audio engineer side, is way louder than the rest of the SFX, and since there’s only one of it, I’m pretty sure you will notice it if you don’t listen to some background music. The cars’ sounds are alright, but the menu music is there… there is music in the menus. Congratulations. …is the name of the developer team, who wanted to create a spiritual successor to Burnout. Why? Because Paul Ross, Fiona Sperry, and Alex Ward are the three founders, and they previously worked at Criterion, giving a sense for their idea. And there aren’t a lot of people in the team – aside from the three founders, there are four more people, a total of seven -, and while it might sound that I’m talking about a 2.5/10 or so game, Dangerous Driving is getting more than that, even if it feels unpolished or even unfinished. I didn’t uninstall it in two and a half minutes. However, I think the controls are significant… sensitive. You have to carefully manoeuvre the car (six classes from sedans up to the Formula DD ones), and the classes provide different experiences (there will be some that can easily go 300 kmph+, and you’ll get to drive one of those in the second race in the Dangerous Driving Tour, which is effectively the career mode), so if you get a race, you must finish first, if you want to get the gold medal out of the three, and you must have to learn how the controls feel somewhat floaty in my opinion. I think that’s somewhat disappointing. – Where on Earth is the soundtrack? – Why do we have to wait a month for the online?